At the college’s inaugural Community Showcase on Tuesday, Dec. 4, hundreds of attendees gathered to hear a report on a stellar year and honor the Wilsons for their philanthropic efforts in North County and beyond. Pictured above, left to right: Palomar College Foundation Board Chair-Elect Pete Rogers; Foundation Executive Director Stacy Rungaitis; 2018 Comet Award recipient Bob Wilson; Palomar College Superintendent/President Dr. Joi Lin Blake; and Foundation Chair John Masson. ESCONDIDO, CA (December 4, 2018) — Three hundred of North County’s civic, industry and community leaders gathered at the California Center for the Arts on Tuesday, Dec. 4 for the inaugural Palomar College Community Showcase. 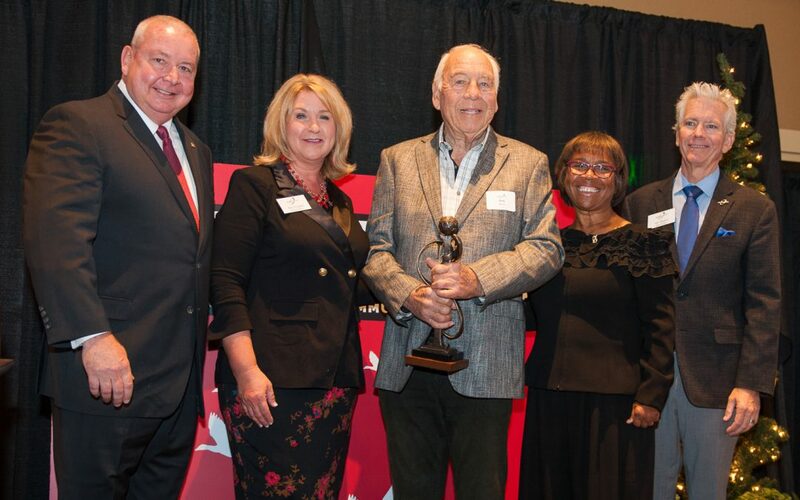 During the event, college officials reported on a variety of exciting initiatives, programs and events from the past year on campus, and presented local philanthropist Bob Wilson with the 2018 Comet Award. Accepting the Comet Award, Wilson reflected on his lifetime in North County, beginning with a primary education just a few miles away from Palomar College. Today, he has become one of Palomar’s most ardent supporters, donating $400,000 for the construction of the newly-unveiled Anita & Stan Maag Food & Nutrition Center at the San Marcos campus. 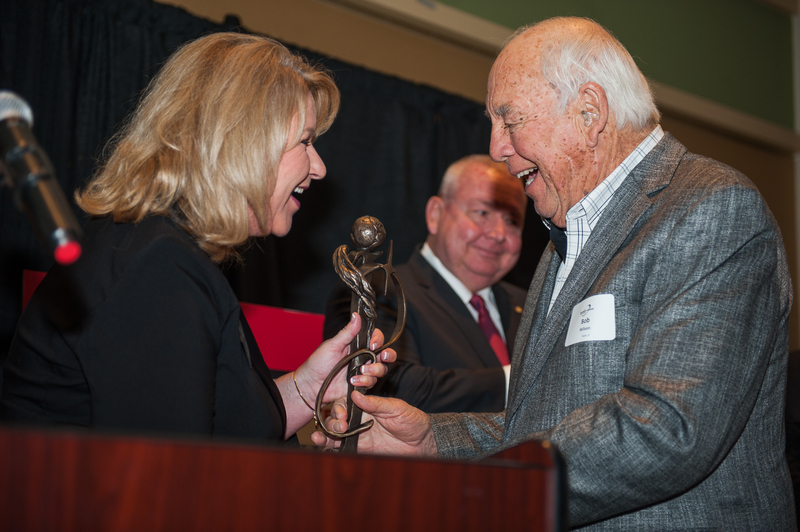 Bob Wilson accepts the 2018 Comet Award from Palomar College Foundation Executive Director Stacy Rungaitis. Wilson also shared some scenes from his recent trip to Chico, where he met with victims of the devastating Camp Fire in Paradise, CA, and personally delivered $1,000 checks to all 980 students and 105 staff of Paradise High School—a $1.1 million donation weeks after the fire. 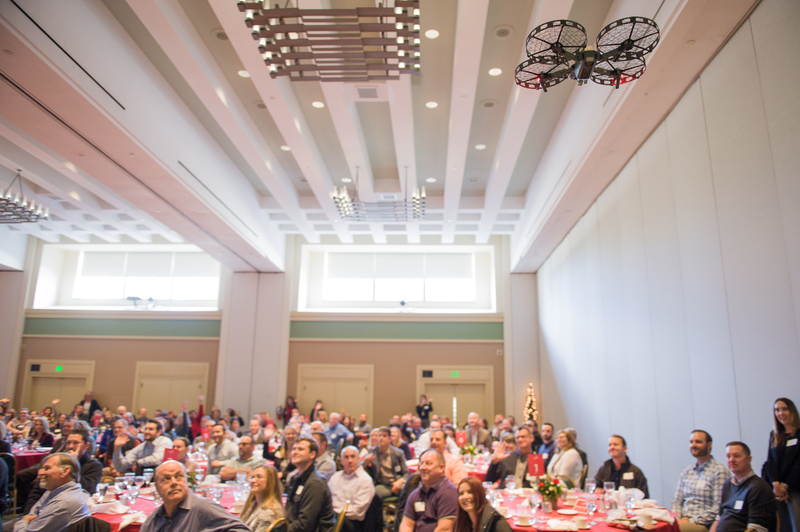 The Community Showcase closed with a drone demonstration by Palomar College professor Wing Cheung and two of his students, who flew a drone overhead through the banquet hall to illustrate the capabilities of the technology, in which Palomar has become an educational leader during the last two years. Palomar College Community Showcase 2018 from Palomar TV on Vimeo. Comet Award 2018: Food Bank from Palomar TV on Vimeo.